The effects of the prevalent menace of Nigeria government contracted e-rats to invade diverse social media platforms with concocted, misleading and mischievous narratives regarding the genocidal war levied against Biafrans years ago, can no longer be tolerated. The despicable act of annihilation committed by the Nigerian government with the full support of Harold Wilson led British government and a band of allies which is presently being coated with lies and deception on the internet, has provoked some measure of responses to these false narratives. These e-rats which are predominantly Yorubas under the guise of justifying their selfish gains, have resorted to confusing the gullible through their blackmails against the present Biafra agitations championed by the Indigenous People of Biafra (IPOB) worldwide, under the able leadership of Mazi Nnamdi Kanu. They employ dubious and offensive narratives suggesting that the reason behind the blowing up of the Niger bridge by Biafra soldiers during the Biafra/Nigeria war stands as a testimonial that Delta State of today was never considered as a part of Biafra territory. According to them, if the government of Biafra and her armed forces actually had Asaba and environs as her integral parts, the Niger bridge would not have been touched by the Biafran fighters at the heat of the war. The narratives are essentially, products of congenital idiots and academic dwarfs on historical discipline. It is therefore necessary to put the records straight for knowledge and posterity, the experiences concerning the history of the genocidal war levied against Biafrans and how those of them especially occupying the Eastern part of River Niger, an area commonly referred today to as South-East, that of the Western part known as Delta State and Igbanke (Igboakiri) people carved into Edo State. Let it be pointedly stated before the global community that prior to the amalgamation of Nigeria in 1914 when there existed nothing at this part of the world known as Eastern Nigeria, all the territories within the present day Delta State down to the Atlantic Ocean, were historically known and addressed as Bight of Biafra. That was why the Baptist Church in the West African sub-region continued addressing their stations at Onicha-Ugbo, Ughelli, Ubulu-Unor and Kwale as "Baptist Church of Biafra" until 1954 when they were finally adopted as "Baptist Church of Western Nigeria". The church authority in concert with other branches in the Eastern region, turned to be addressed as Baptist Church in Eastern Nigeria. The Baptist Church then decided to adopt "Western Nigeria" for all those at the West part of the Niger and "Eastern Nigeria", for all those on that region. According to history, the name "Biafra" then was going into extinction which was no more useful for addressing public institutions as it were at the advent of the church on the land in the year 1872. Had it been there existed proper consultation, the parishioners of the Southern protectorate into Eastern and Western regions, 70% of the territories of Midwest like the present day Delta State and Igbanke (Igboakiri) people of Edo State would have clearly been part of the then Eastern Nigeria, the waterways of River Niger notwithstanding. Unfortunately, these contracted Yoruba e-rats bereft of requisite historical knowledge who labor to provide analysis bordering on the people of Delta State do not know these historical realities. 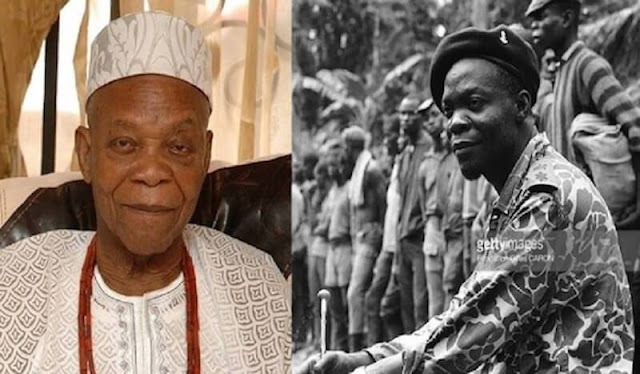 (1) The Biafran government under the leadership of General Chukwuemeka Odimegwu Ojukwu not would have employed military force in ousting the then military governor of Midwest, Colonel David Ejoor who retained his allegiance to Lagos, and replaced him with Major Albert Okonkwo whose allegiance was to Enugu. Had the territories and inhabitants were not seen as Biafrans, a military officer would have been drafted from the Eastern region to the government house at Benin-city on occupational capacity. This was never conceived as a military officer from the same Midwest, Major Albert Okonkwo who was appointed by General Chukwuemeka Odimegwu Ojukwu, to hold the administrative office of the region. He was ousted shortly after by the Nigerian military and was replaced by Major Samuel Osaigbovo Ogbemudia whose allegiance was to Lagos, the then Nigerian capital city. (3) These demonic analysts should also realize that if the Supreme Military Council that was administering the nation of Biafra during those war years did not consider Midwest as part of Biafra, Vice Admiral Anuku from the present day Delta State would not have been given the office of Biafra Chief of Naval Staff. Admiral Anuku, like Major Albert Okonkwo, Brigadier Joe Achuzie amongst many others, gallantly fought for Biafra all through the war. How then could someone mischievously concoct narratives that the inhabitants of Biafra territory of the then Midwestern region were not considered as Biafrans? (4) Another proof before the global community that Delta State was as Biafra during the war and fall of Asaba into the hands of Nigerian army under the command of late Colonel Murtala Mohammed and is yet today many years after. The Nigerian soldiers massacred Asaba people in what was described as one of the worst genocidal devastations of what took place during the annihilating war. It was such a gruesome massacre that nobody was left to bury the lifeless bodies which littered the streets of Asaba. Vultures fed sumptuously on the decomposing bodies. If the people of Asaba are non-Biafrans, how come Nigerian soldiers never visited any Yoruba or Esan community within Oduduwa or ancient Benin kingdom with the same venomous measure of genocide as that committed in Asaba? Additional reasons could yet be advanced to buttress the points that the people of Delta State and Igbanke (Igboakiri) in Edo State are as Biafrans as today, before, during and after the gruesome war levied against the Biafran people. The fact that these hired e-rats are yet reeling in disgusting ignorance, does not and cannot in anyway change well documented historical records. Every part of Delta State with Igbanke (Igboakiri) in Edo State remain permanent/indisputable parts of Biafraland. Arguing in the contrary either amounts to mischievousness or pitiable ignorance.